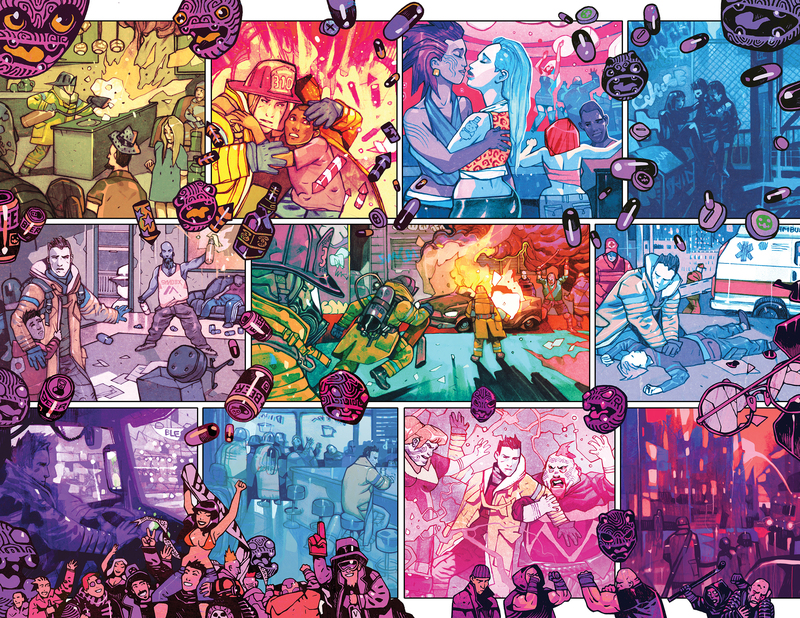 In his comics-writing career, Steve Orlando has built a passionate fanbase through driving books that walk effortlessly between character and action. His first comic, the “queersploitation” Jamaican revenge epic Virgil, began as a Kickstarter project before being published by Image last year. His success with DC’s Midnighter solo title spawned not only an exclusive contract with DC last spring, but also a Midnighter and Apollo miniseries to follow it. 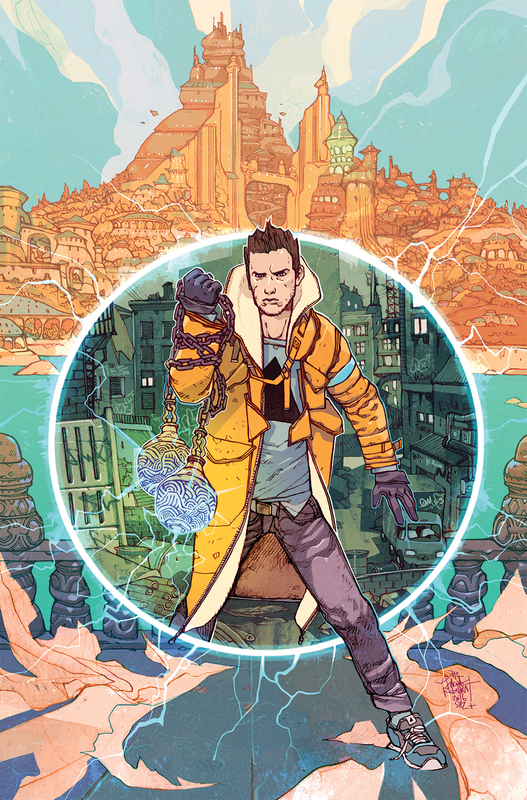 Though he’s also working on Supergirl and an upcoming run on JLA, Orlando is making a single foray into creator-owned comics this year with Namesake, illustrated by Polish artist Jakub Rebelka and published by BOOM! Studios. In the new miniseries, Orlando addresses the story of a son trying to lay his fathers’ (plural) remains to rest. The creative team pushes that emotional concept into the realm of sci-fi/fantasy, as each of Jordan’s fathers comes from two very different worlds; our Earth and the magical realm of Ektae only connect for a few days every decade, giving Jordan’s mission a new extra-dimensional air of urgency as he also struggles with his own internal challenges. 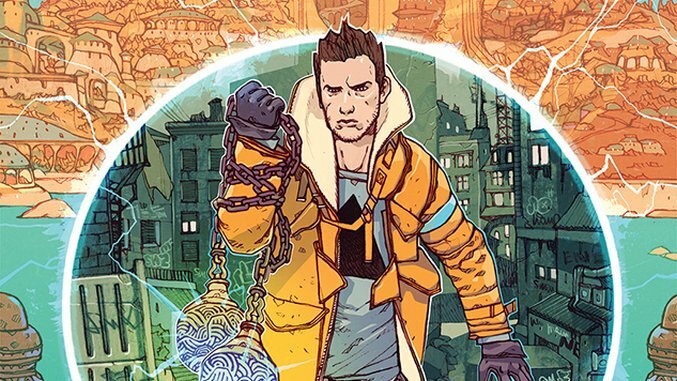 Namesake is a classic hero’s journey, complete with both punching and self-discovery, set in an entirely new and unique world. Paste chatted with Orlando and Rebelka to discuss the inspiration and process behind this startlingly original project. Paste: Finding the right collaborator to work on a creator-owned title can be a difficult and lengthy experience. How did you two meet and decide to collaborate, especially since Jakub is relatively new to comics? Steve Orlando: The credit for connecting with Jakub for Namesake goes to our on-point editor Eric Harburn. Eric and I had been shooting concepts back and forth for years, but when the idea, the image of Jordan Molossus and his Urns popped into our heads, it was something we both latched onto. Like I said, Eric and I had been talking for years, trying to find the right concept. He is intensely dedicated to watching up-and-coming creators, and being there first. In my case, we had been talking since Undertow. And he is likewise dedicated to reaching out to new and exciting artists. Once Namesake began to come to life, Eric brought up Jakub, whose work I was not yet familiar with, and I couldn’t imagine the book without him on board. I can’t credit Eric enough for having his eye on the movements of comics and being able to visualize a team, then make it a reality. Jakub’s style is like nothing we’ve seen before in American comics, and that’s perfect to bring to life the world of Ektae. 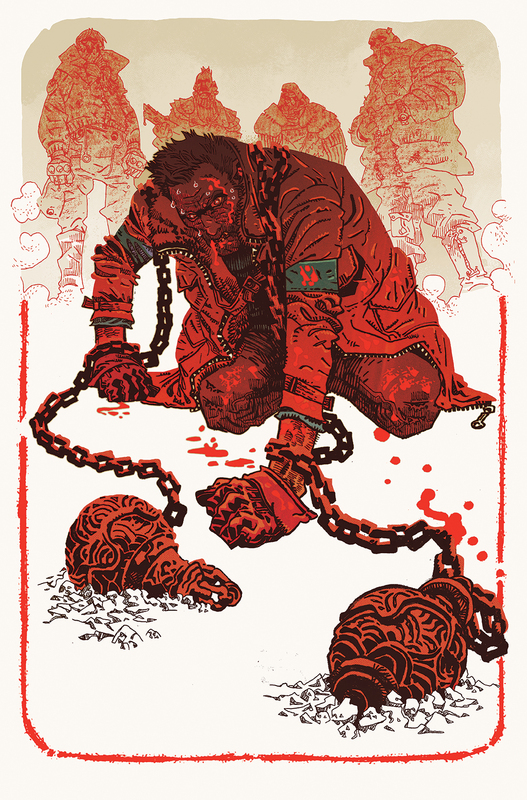 Jakub Rebelka: In my case it was Eric and [Assistant Editor] Matthew [Levine] from BOOM! who contacted me. They sent me the synopsis of Namesake written by Steve. I started to read: “Earth intersects with Ektae for seven days every seven years” / “Portals, Magic, Strange technology” / “Main character Jordan is on the quest from Earth to Ektae to deliver his parents’ ashes to their rightful resting place”—right away I started to picture those things in my head and there was no turning back. I had to illustrate this story. Paste: Steve, you mentioned in a previous interview that you want to actively collaborate with Jakub, and the importance of trusting and being open to co-creators. What did the creative process look like for the two of you? Orlando: For me, working a different schedule on a different continent than Jakub, it’s exactly what you said, it’s about trust. That means giving wide berth for character designs and visual cues. I try to talk more about the feeling brought on by a design than what it actually looks like as much as possible. And it means opening up the script as much as possible when it comes to layouts, beats and storytelling, to let your collaborator flex their muscles and deliver something better than you could have ever imagined. And then you do the hard part: you let it go out into the world. You plant the seed, and let it grow in its own way. Every script that goes out is an undefined moment, and Jakub takes those moments and delivers more than 100% every time. Rebelka: Steve and the BOOM! team gave me a LOT of freedom in creating the characters and building the world of Ektae. I am very grateful for this level of trust. Being able to imagine all the elements of a different world, including vehicles, buildings and a way that those people are dressed is a dream situation for every artist. Steve often left some notes and references for me in the script. Those guides were very important for me because I knew in which direction he wanted to go; the way I was going to get there depended on me. Paste: Were there any challenges you encountered in that process that you didn’t expect? Orlando: The challenge for me is mindset and headspace. Contrary to when I was working on other creator owned books like Undertow and Virgil, I am now working on a fair amount of licensed characters at the same time as Namesake. And the work styles are complementary but different. Work for hire IP, to me, is like refurbishing a room in an old house, sometimes 75-years-old, sometimes more. Maybe you put on an addition even, but you’re building on and polishing what’s there. With creator-owned IP, you’re building the foundation—the work is different, challenging and exciting. You have to make sure the house can stand for years, potentially decades. It’s primal, it’s raw, it’s risky. It’s exciting. And so switching back-and-forth between the mindsets, the rules of work for hire and the rules of creator-owned (and make no mistake, there ARE rules, even if you have to create them for yourself), has always been the biggest challenge for me. Rebelka: The way you work on comics in the US is 180 degrees different than you do in Europe. For me it’s a jump into deep waters. I enjoy it and try to do the best work I can. Paste: Steve, you also said that Namesake was influenced in part by your love of Final Fantasy. Jakub, do you share his love for the game franchise, or did you pull from other sources of inspiration? Rebelka: I have actually never played that game :) I watched the trailer since Steve mentioned it in the script, but I could only guess what Steve meant by Final Fantasy. That’s the danger when your inspiration comes from games or movies. It can have a different meaning for both of us. I believe it’s better to trust the description of the world and story that Steve wrote; that was the true inspiration for me. It’s also the magic of this process—the interlacing of ideas and inspirations. The description of the world of Ektae: a strange world with magic and technology that is completely different than ours and evolved around the new, fifth magical force—was more than enough to inspire me. I wanted to make the world of Ektae more spiritual and organic rather than stick to the technological pragmatism of Earth. Those two worlds intersect and there is an exchange of ideas. For example, we have cars on Ektae that look like cars because a car is something that arrived there from Earth. It looks like a car but it is built in a different way, it runs on a different fuel, it’s built on Ektae’s magic. 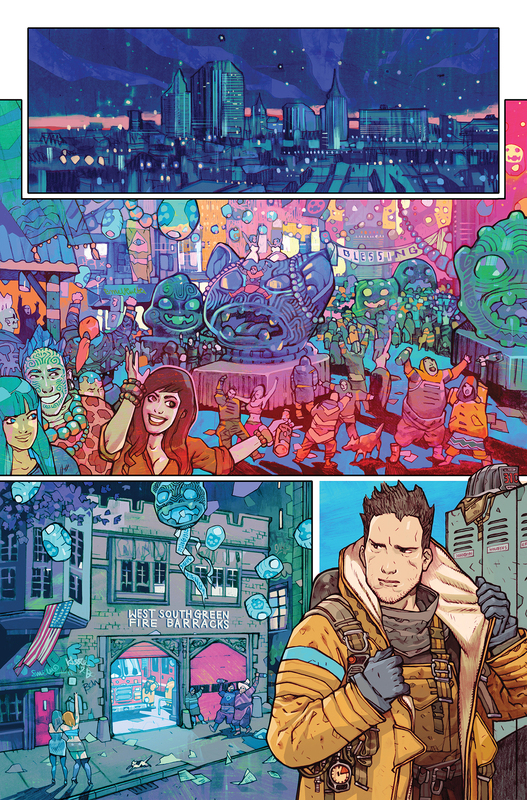 Paste: It was announced that Namesake would be a miniseries with monthly issues. Why choose that format instead of a graphic novel? Orlando: The choice for me is about the fact that people consume comics in different ways. 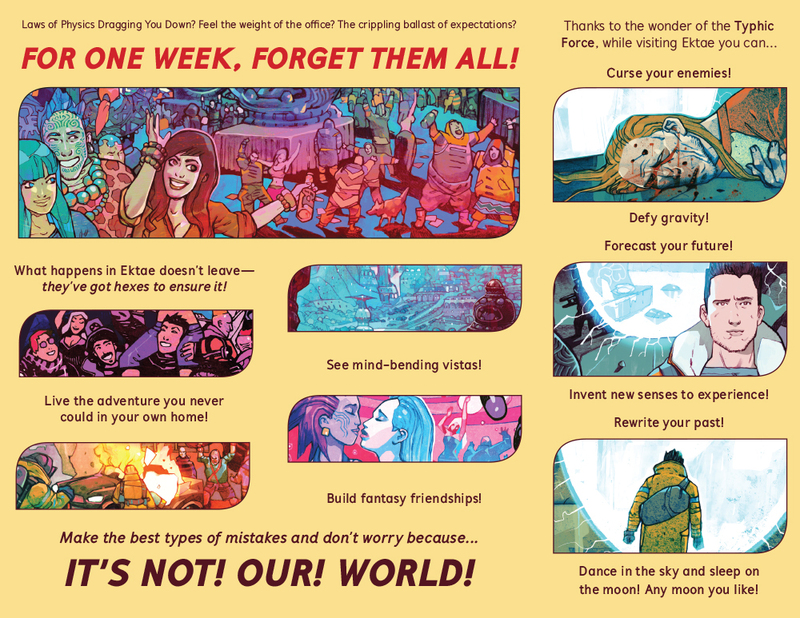 Print, digital, periodical, mail order, graphic novels—the way people read comics is changing. And with a story close to me, with all stories really, because I wouldn’t work on a book if it wasn’t important to me, I want to do everything I can to meet every reader possible. And that means comic shop readers, but it also means distribution routes and formats that can appeal to people who perhaps don’t prefer to buy weeklies, or go into a comics store. If we’re trying to say something with comics, to excite people and show them wonder, we have to go to them in all ways. 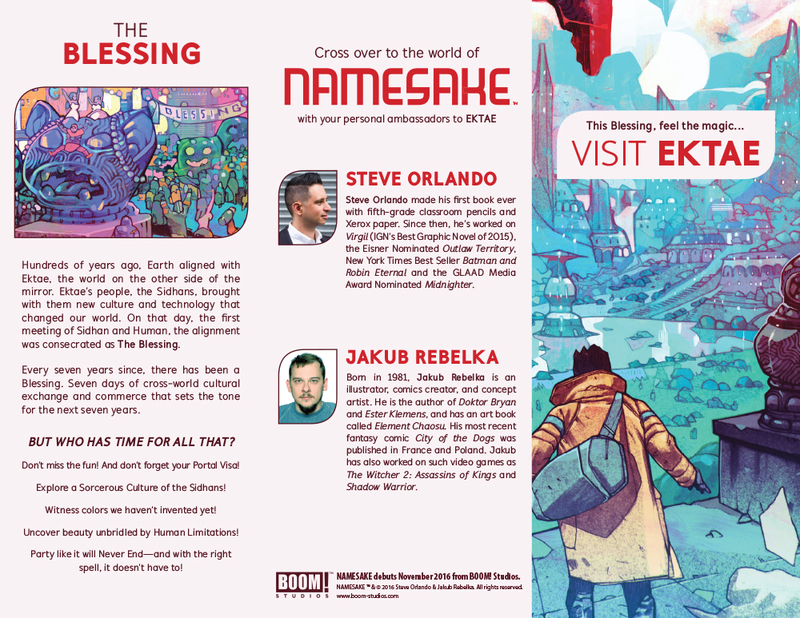 So in this case, a periodical and digital release will quickly follow to the graphic novel edition, so you can explore Namesake as you personally wish. Paste: BOOM! is probably best known for their comics with licenses from TV and a ton of all-ages books, so some people might be surprised to see what seems to be a more serious original title. Who are you trying to reach with Namesake? Is there a particular age range or demographic you had in mind? Orlando: Namesake, I would say, is a book for the PG crowd—perhaps a bit above that. PG-13? At the same time, we don’t have any scenes in the book that couldn’t appear on How to Get Away With Murder, IF that show was about magic runes and sorcerous murders. We are a visceral action book, yes, but we are not mature readers. Like most creator-owned work I do, it’s in some ways for a young me, in my teens, wondering if it was okay to be who I am, and wanting an adventure that showed me that. Paste: Steve, your previous work focused on queer individuals in Virgil and Midnighter. They were more about personal confrontations with identity and a sense of self. Namesake seems to be more focused on an individual in a queer family—are you aiming to achieve something different? Orlando: I would say the goal of all these books is connected. Jordan does struggle with who he is, his anger at feeling abandoned by his parents, only to find out the truth was much more complicated. But the real core of all these books is acceptance, acceptance by the narrative itself. These are books that strive to rivet, entertain and use queer individuals, or queer families in this case, as just another accepted part of the narrative. They’re not fetishized, they’re not one-dimensional, they’re an equal part of the fabric of the story. That’s acceptance, that’s inclusiveness and that’s the goal of all my work, regardless of if it’s in Gotham City, Jamaica or under the sea. Paste: It’s particularly interesting to think about a queer family story in the context of current events where a lot of queer people choose or are forced to leave their biological families and build their own “logical” ones. Is Jordan’s family a sort of aspirational example in contrast to that reality? Orlando: Well, Jordan’s family has problems like any other, certainly. I hesitate to say aspirational, as I wouldn’t cast judgement on alternative families in any way. Quite the opposite, Namesake is perhaps at the end about who we THINK family is, who we EXPECT it to be, and who it REALLY is. And that doesn’t always mean blood—it can mean much more. People that love you for who you are, regardless of relation. The hope for me is that reading the book, we feel that no matter what the expectations, family is what we make it. It can be anything, as long as it’s made with support and love. Paste: The theme of laying a parent or parents to rest, physically or psychologically, comes up quite a bit in a variety of forms. In comics you have Duffie Award winner M.F.K., Weirdworld, Southern Bastards, Fun Home; on the screen there’s Six Feet Under and Little Miss Sunshine. Even Shakespeare confronts it head-on in Hamlet. Why do you think this issue is so universal and enduring? Orlando: I think there’s innate, human mystery there. These are the people that existed before me. And it’s also the dinner bell on your own mortality. You look at the passing of a parent, think how old they were when they created you, and think, well, maybe that’s what I’ve got left. Maybe not. But maybe. There’s a great, deep emotional well of dealing with the loss of someone you love, and there’s a great, heavy memento mori, a cosmic horror almost, in realizing you’ll be there someday, too. It’s a fight. In Namesake it’s a literal fight, but it’s a fight for all of us—between hope and cynicism, faith and understanding, reason and illogic. It’s all right there in the moment when the people who created us are uncreated. But in Namesake, at the end of all things, maybe we create something new.